Collaboration with colleagues and students, and a willingness to try new things for the first time, can lead to inspiring examples of learning with our students! Around the same time I was working on this system with my students, I also had the opportunity to watch Joyce Kim’s students do a presentation on Adobe Voice. (For more on those presentations, check out this previous Collab Blog post.) It struck me fairly quickly that this App would be a great way for kids to demonstrate mastery of this four level analysis while allowing creativity and genuine student engagement in the project. Essentially, their job was to choose a photo of any type that they felt they could analyze. It could be a painting, photo, advertisement, political cartoon, etc. Of course, doing something for the first time, I wondered how they would do. Would the App do what I wanted? Would they buy into it? Most importantly, would they get it “right?” The results were encouraging, and I wouldn’t be writing this blog if I didn’t see the value in the App. Their presentations made their thinking and learning visible in a creative way that also allowed me to see if they really "got it." I also see the value in collaboration and what goes on in the Collab Lab. With minimal time commitment on my part, I learned about something quite valuable to my students, and they, in turn, demonstrated proficiency in their assigned skills. 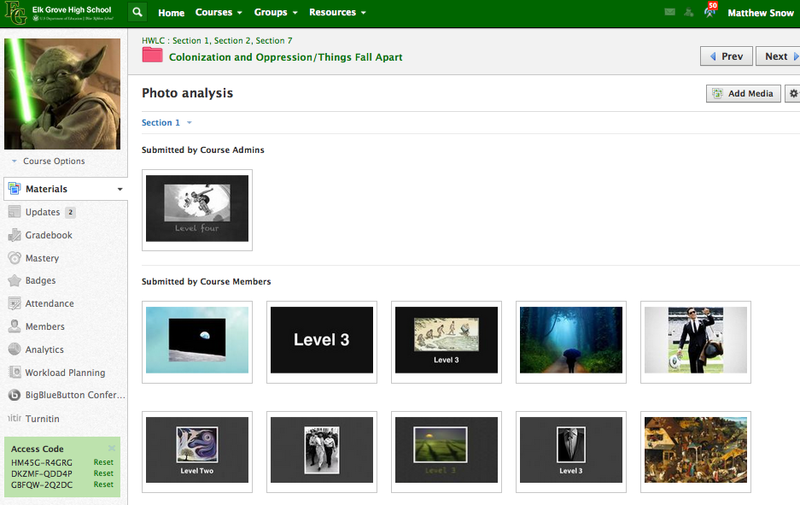 To curate all the presentations from each class, students uploaded them to a Schoology Media Album. Having the presentations in a Media Album allows the teacher to easily access them to share/present them to the class. Also, students can access all the presentations for peer review. The curated examples can also serve as models of work for future students. Have you discovered new ways to engage students with creative ways to demonstrate complex thinking skills? Please share your ideas with the Collab Lab! I loved looking at these examples--you can really showcase a student's strengths and understanding here, not to mention it probably adds to their sense of accomplishment hearing their own voice dissecting, analyzing, and interpreting art in this way. Thanks for sharing.